Take a look at NATO's armed forces in European states, as well as in Afghanistan. Do the New Year's puzzle! Take part in an exciting game at Sputnik: create your own New Year character and share your greetings on the upcoming New Year on social networks. Also, for the festive mood - welcome to the GUM-Ice Rink and GUM-FunFair! On September 17, the Russian Hmeymim air base in Syria lost contact with an Il-20 plane with 15 people on board amid an operation being carried out by Israeli jets in Latakia province. Later, the Russian Defense Ministry announced that the plane was downed by a Syrian S-200 surface-to-air missile system. Dozens of people were killed in Genoa, Italy when more than 200 meters of Morandi bridge that makes a part of A10 motorway collapsed. 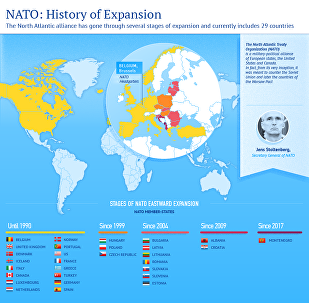 The alliance has gone through several stages of expansion and currently includes 29 members. 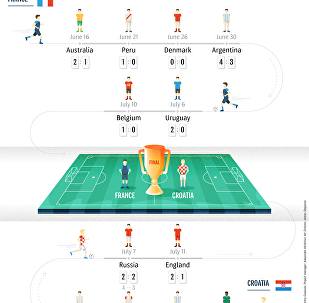 The group stage of the 2018 FIFA World Cup ended in Russia on June 28. FIFA summed up the statistical results of the current mundial. Where Are You From, Fan? A total of 25 percent of FIFA World Cup 2018 fans are women.